It's time to move to the digital age. No more hassles of running a store and setting up in the right place and hoping people find you. Now you can shop online! 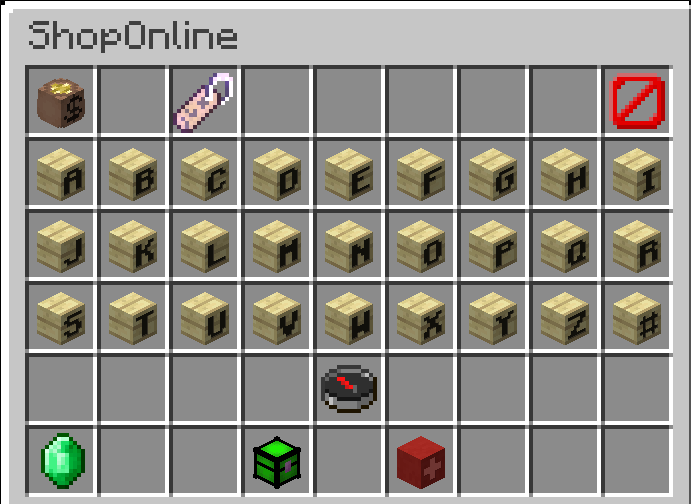 This is still a work in progress and you cannot sell your items online yet, but you can buy items from the server. When you first open the shop you will see an inventory with a few different things. Top left shows your current balance. Bottom left is an emerald which will let you sell all emeralds and emerald blocks in your inventory. There are 2 buttons for Your Items and Sell Item which will do nothing right now. There is a Browse button which will let you browse through every available item, or you can click on a letter to search for items starting with that letter. While you are browsing items there are arrows to move back and forward through the pages. Left clicking an item will buy 1, Right clicking will buy a stack. Most of the prices are calculated from the materials needed to create the item, and I mostly made up the price of the base materials. When selling is implemented, you will be able to put up any item that currently exists as a server listing at a lower price than the server offers. The lowest priced item will always be sold first to buyers. Example: The server offers Dirt at $1.00 - You cannot sell dirt for more than that. If Tokes puts in dirt at $0.95 and I put in dirt at $0.90, mine will automatically sell first until it is gone, then Tokes' expensive dirt will be sold. You will also be able to have your own custom shop page for special items, such as enchanted armour/weapons. The number of custom pages you can have will increase with your rank. The server prices are meant to be high, players will be able to offer better prices when selling is implemented. If you have feedback on the prices, or suggestions on items that aren't available and should be, or items that are available and shouldn't be, please let me know here on this thread. Guardian Blocks will now protect from 0-255 Y. If you have an existing zone you can remove the block and get a new one to increase the height. - More updates will be coming to make Zone creation and management easier for players. Will work with rewards points shops too? i've noticed that emeralds have gotten cheaper and you now only get $50 form them. Why the change in price? I think $50 is the regular emerald price.